We’ve prepared some simplified charts with our analysis comments spliced in. Some of the analysis comments have been redacted to preserve space. Click the charts to open them in full-size in a new browser tab. On the 31st of March, we offered our clients two short-term suggestions for the S&P 500, both of which implied that more upside was to come later during the year, but with slightly differing short-term developments. Sometimes, it’s not possible to accurately assess what the market is doing in the short-term, but the mid- and long-term pictures might be somewhat clearer. This was one of those times. As was proven in hindsight, the scenario with a triangle was the correct one, and the S&P 500 proceeded to put in a new low below 2340, as suggested, before taking off. On the 14th of April, we suggested that the triangle was coming to an end, that the index was deeply oversold, and that it a reversal and new advance to 2430 was very likely to start very soon. That proved to be correct, except that the advance stalled at 2406 and 2430 was reached in the next wave phase. On the 26th of April, we suggested that the index was overbought, and might need a consolidation. That proved to be a good call, as the S&P500 went essentially sideways for the next 2-3 trading weeks. On the 5th of May, our structural Elliott Wave analysis had changed slightly for the S&P 500, and we suggested a top and violent mini-crash down to 2355 would take place next. This call was repeated on the 15th of May – and was proven correct just three trading days later, as the S&P 500 reached 2353 intra-day. Before the start of trading on the 19th of May, we issued a notice to the effect that while the S&P 500 could have topped out, if 2386 was regained, the index would likely top out later this year. The latter option came true, as the index retook 2386 the same day, and since then has advanced significantly to new highs. On the 26th of May, our call for 2430 to be reached was reiterated – which was proven correct just a few days later. 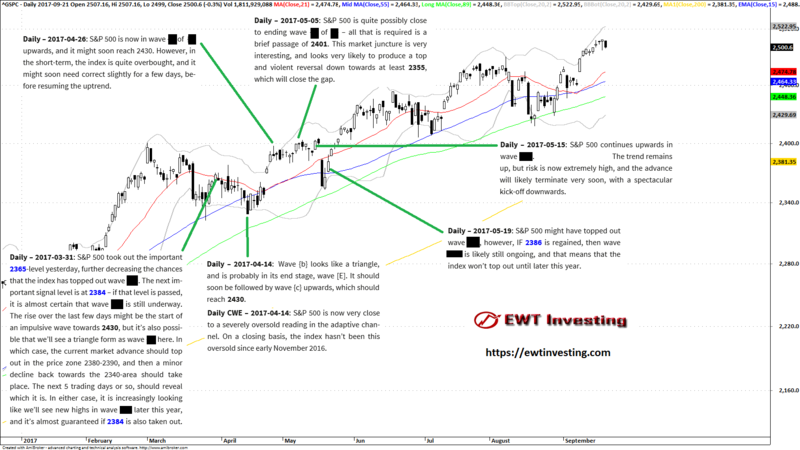 On the 2nd of June we suggested that the S&P 500 would make a correction and then reach 2450. This was to some degree off the mark, as over the next days, the ensuing correction was shallower than expected, and the advance after the correction only reached 2446. On the 16th of June, we suggested a triangle was completing, and that the S&P 500 would advance to 2450 – which it did just a few days later, hitting approximately 2454. The next significant update was made on the 30th of June, when we suggested that the correction was still ongoing and would be followed by an advance (reiterated on the 7th of July as we suggested the advance would start soon) to 2460 within 10 trading days. Both the update for the 30th of June and the 7th of July were proven correct, as 2460 was surpassed by the S&P 500 9 trading days later. The next significant update was made on the 9th of August, when we called for the just started correction to go sideways for 1-4 weeks. Both the 2453 and 2435 levels which were mentioned as non-significant targets were hit, and the correction lasted approximately 4 weeks, as suggested initially. So, another analysis update proven correct. On the 16th of August, we suggested another dip to 2430-2440 would follow, which is what happened. However, our timing was slightly off, as we expected the ongoing upwave to take some more time, which it didn’t. Just 2 days later, the S&P 500 reached our target area of 2430-2440, and overshot it somewhat the next day. On the 18th of August, we called the S&P 500 deeply oversold, and that a significant reversal would take place soon. We were proven correct, as the next trading day, the S&P 500 bottomed out, and changed direction. On the 23th of August, we made the call that the S&P 500 would now advance to 2500+, but suggested 2471 as an additional buy signal for those wanting more confirmation. The 2500+ target was reached on the 15th of September, and we were yet again proven correct. Our Elliott Wave analyses for the S&P 500 were very good during the time period examined in this analysis summary. There’s really not much more to say about it, except that we’ll keep on working hard to continue to stay on track with our technical analysis. Access to our S&P 500 analysis section is included in our Global Elliott Wave Coverage subscription service. 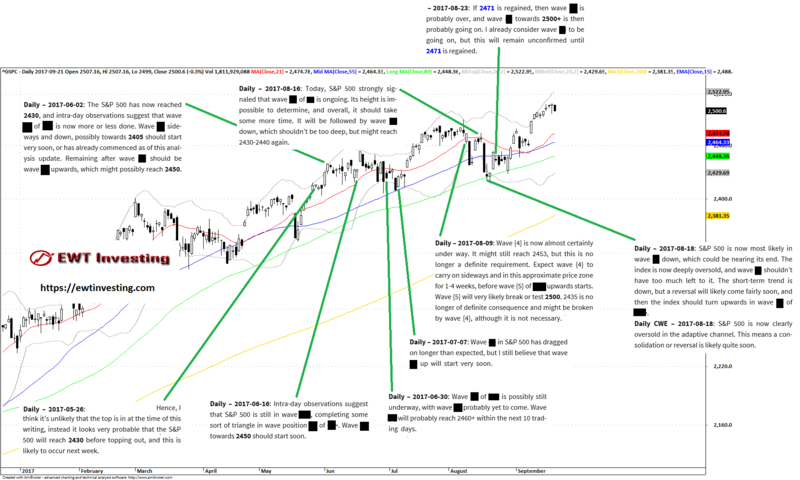 The S&P 500 analysis is updated every Monday, Wednesday and Friday, usually after the market close. If you are interested in our services, please contact us for more information, or sign up now – we only have 1000 subscription slots available in total.